When you know you deserve something real good, it’s time to head to Steak & Lobster. 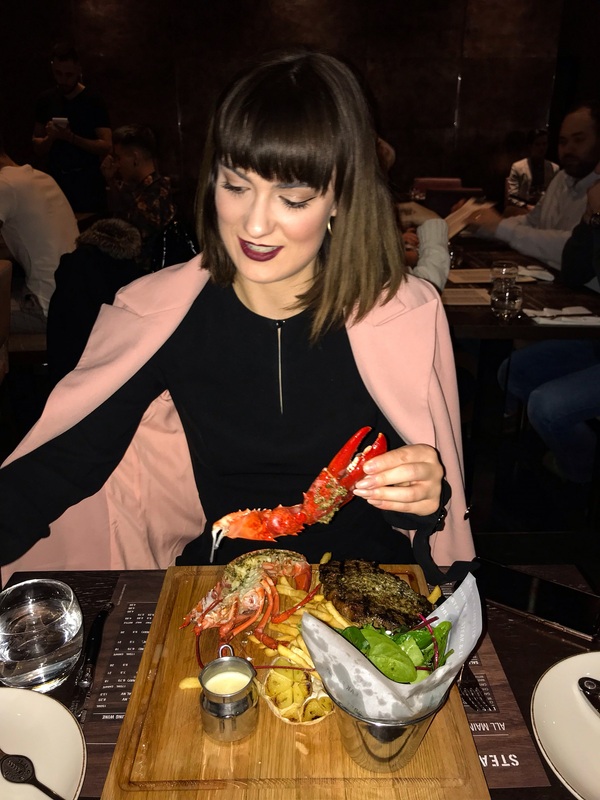 A restaurant that prides itself on selling, you guessed it, steak and lobster, it’s the perfect spot to take a date, spoil your parents or treat yourself to an evening out. With four locations around London, we headed to the Bloomsbury spot for dinner one chilly Friday night. The restaurant is adjacent to a stylish hotel foyer, resulting in quite an open-plan dining space filled with tables, contemporary décor and a chic bar. While the menu focuses predominantly on serving ‘the finest lobster and the freshest steak to your plate’, there are also a range of tasty bites and salads if you want to mix the table spread up a bit. We started with the crispy flat smoked beef tacos with lime and cilantro, which were the perfect bite-size for Kristen to eat without ruining her lipstick. A surprisingly vibrant and fresh dish, we’d highly recommend nibbling on these before the main course arrives. As well as the tacos, we couldn’t resist ordering the chilli cheese bites too. Little fried balls of cheese with a chilli kick and crumbed outer, they were a great winter pick to warm you from the inside out. If, like us, you can’t quite pick between steak and lobster, ¿Por qué no los dos? The surf and turf comes with a grilled rib-eye steak and half a lobster with spicy roasted garlic chimichurri butter. You have the option of how well you want your steak done, and whether you want your lobster grilled or steamed. Our steaks came out perfectly medium-rare as we’d requested, while the steamed lobster was full of flavour and wonderfully tender. All the mains are served with unlimited fries and salad, but honestly if you can polish off your first plate and still have room for more we applaud you! We were practically ready to roll straight out of Steak & Lobster and straight into bed when our charming waiter Mario insisted that we stay for dessert too. Their signature dessert is a smashed-up mix of honeycomb, brownie, vanilla ice cream, chocolate fudge and toffee caramel sauce all served together in a mason jar, so we went with one of those to share. It was satisfyingly rich, but after all the delicious food we’d just eaten one between the two of us was definitely enough! 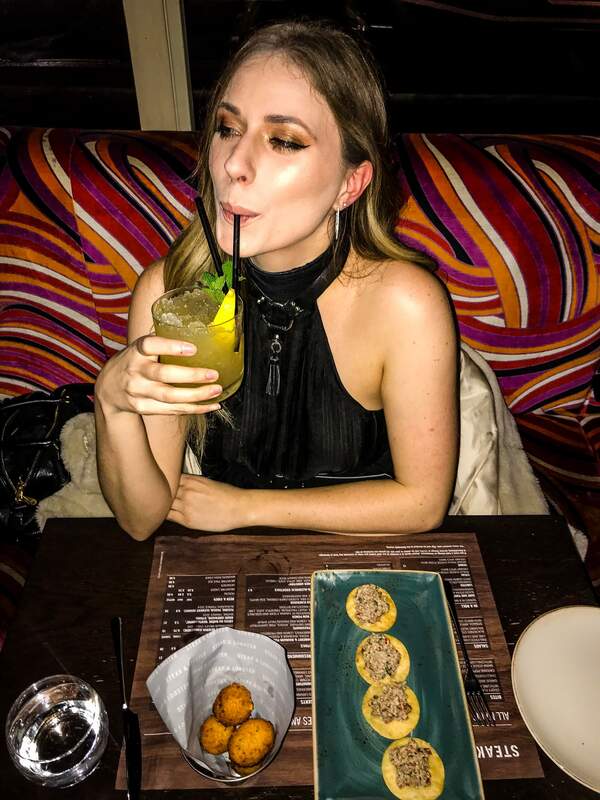 Anyone who knows us knows that we barely visit anywhere without doing a little tour of the cocktail menu, and Steak & Lobster have a list full of variety so there’s something for everyone. For something light and easy drinking to start the meal we’d recommend the Strawberry and Rhubarb Fizz, made with Skyy Vodka, rhubarb and rosehip cordial, strawberries, lemon and topped off with prosecco. To end the meal with a nightcap we loved Before The Dark, a decadent blend of Havana 7 Year, Pedro Ximenez and chocolate bitters. We left Steak & Lobster feeling warm and full, ready to curl up in bed for a cosy night in. If you’d like to dine on this iconic food combination, you can make a booking here. Next articleAdelaide Laneway Has Almost Landed!